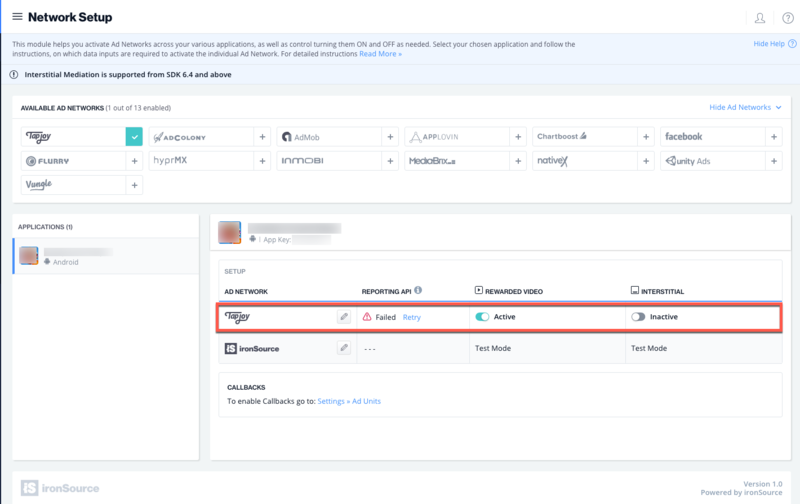 This guide will instruct you step-by-step on how to set Tapjoy live as an Ad Network on the ironSource Mediation platform. Make sure you have correctly integrated ironSource‘s Rewarded Video or Interstitial into your application. Create an account with Tapjoy. You can do so here. Click on the link in the confirmation email to verify your account. Once your account has been verified, you can log in to their partner login here. To gain access to Tapjoy’s inventory within ironSource‘s Mediation platform, you must first add your app and set up Ad Zones in your Tapjoy account. Log into your Tapjoy account. 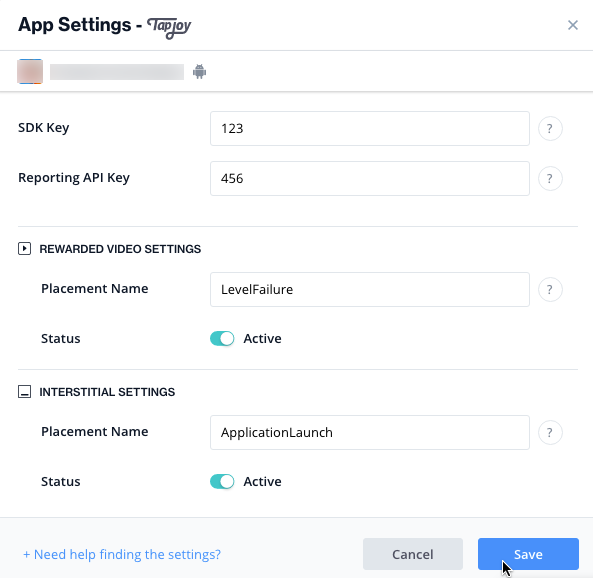 Note: While Tapjoy allows you to create your app with both platforms, you will need a unique Tapjoy SDK Key per platform (iOS + Android) to enable it in your ironSource account. 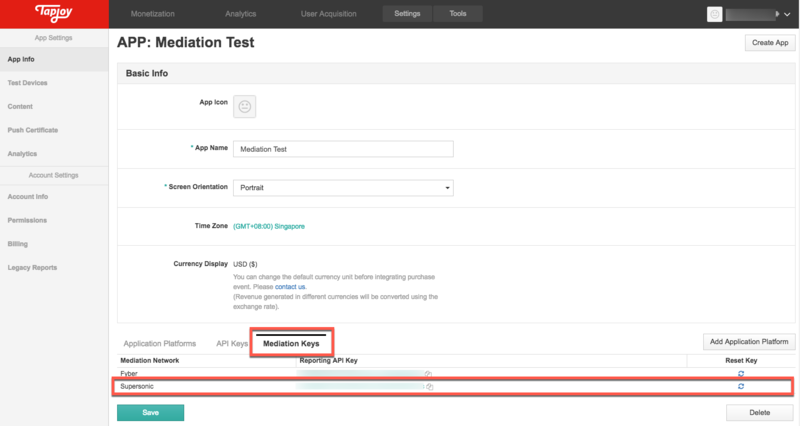 If you use a combined Dashboard on Tapjoy it will give you both an iOS and Android SDK key. Select ‘Create Now’ to finish. Once your application has been added, Tapjoy will create default placements for you. Placements are the ad zones to which Tapjoy delivers ads. This will thus be the placement in your app where Tapjoy’s Video or Interstitial will be triggered through ironSource‘s Mediation. Important! Placements must be user-initiated to work in conjunction with ironSource‘s Mediation platform. Go to the Monetization tab in the top menu and in the left side bar select ‘Placements‘. If you are using the auto created placements, you can rename the placement if you wish. Note that the placement name must later be inserted on the ironSource Dashboard. If you are serving both Tapjoy’s Video and Interstitial, you will need two separate placements, one for Rewarded Video and another for Interstitial. If you decide to create a new placement to work in conjunction with ironSource‘s mediation platform, select ‘Create Placement’ on the right-hand side. Enter the name and description for this placement and Click ‘Create‘. Next, you need to add a virtual currency to your Tapjoy account. All content units on Tapjoy must be associated with a virtual currency. 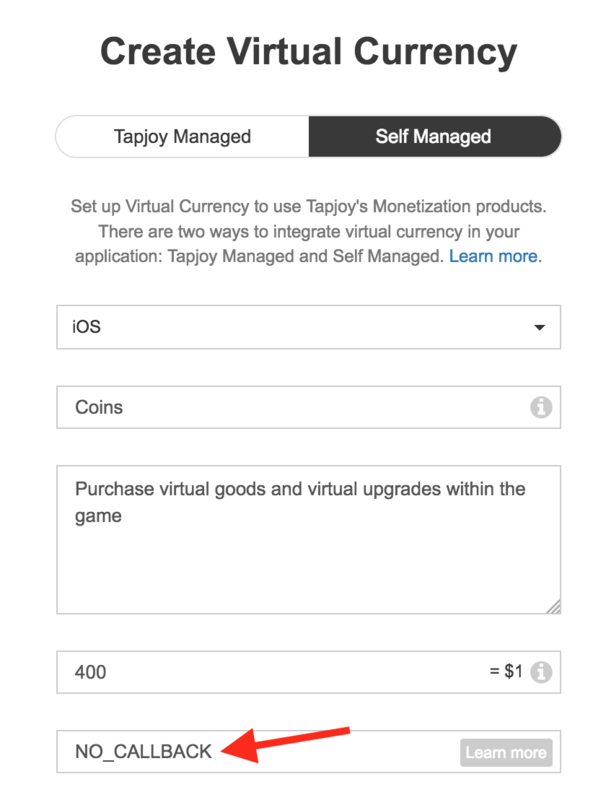 Learn more on creating a Tapjoy Virtual currency on the Tapjoy Knowledge Center. In the Monetization tab, navigate to the Virtual Currency section. Select the ‘Create Virtual Currency’ button on the top right. The below window will appear. Tapjoys recommends the Tapjoy Managed currency but if you choose to use the Self Managed option, we recommend inserting “NO_CALLBACK” in the “Callback URL or NO_CALLBACK” field, as this will avoid unnecessary currency calls as the ironSource SDK handles the rewarding for ads served through our mediation. Currency Name, e.g. coins, gold, chips, etc. Initial Balance, the currency amount your user is given when s/he starts using your app. You can disregard the other steps as they are not required fields; leave them as is. Click ‘Create Now‘ and you will see your defined virtual currency as Enabled on your Virtual Currency dashboard. Lastly, you must add the relevant content card to the placement. Our mediation platform supports both Rewarded Video and Interstitial content for Tapjoy. To add content to your placements, go to ‘Monetization‘ on the top menu bar. Navigate to ‘Create Content‘ on the left sidebar. You will then see the list of Tapjoy’s Monetization products. Next, select the relevant ad unit you want to serve through ironSource‘s Mediation platform. To serve Rewarded Video, select Rewarded Video by clicking ‘Create‘. To serve Interstitial, select Interstitial by clicking ‘Create‘. Platform– if your app supports both platforms, create two separate content units for each platform. Targeting– leave this section as is. Placement– select the relevant placement created to run in conjuction with ironSource’s Mediation. Schedule & Frequency– leave this section as is. Virtual Currency– select the virtual currency created in the former step. Note: Tapjoy Content Units must be associated with a virtual currency, even if you are using ironSource rewards to reward your users. 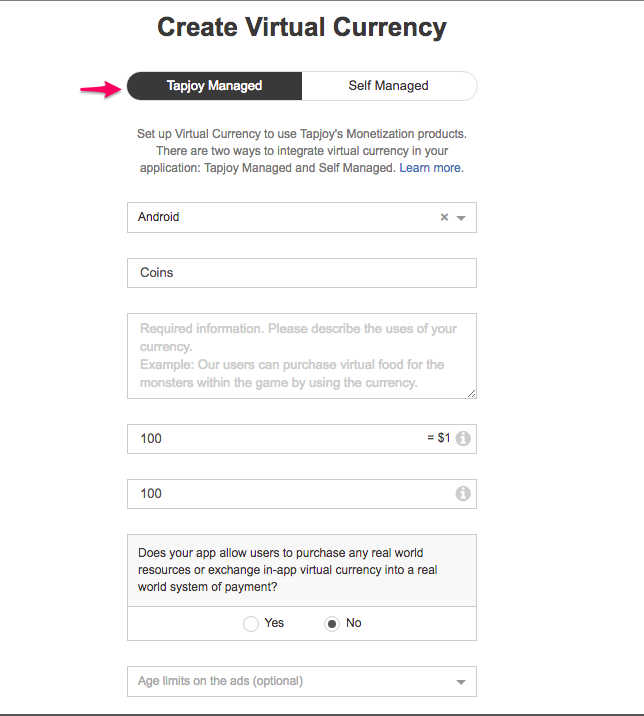 Learn more on creating a Tapjoy Virtual currency on the Tapjoy Knowledge Center. When serving Tapjoy’s Rewarded Video or Interstitials through the ironSource Mediation platform, you should set the Tapjoy reward to zero and hide the reward message. For Rewarded Video, this will ensure you don’t award the user twice and will prevent user confusion when seeing a Tapjoy generated message with a different reward amount. 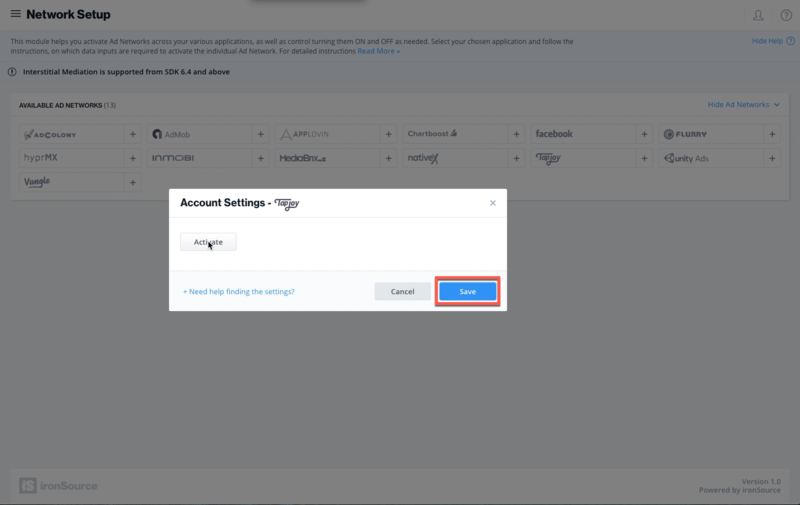 For Interstitial, Interstitials you serve through our Mediation are non-incentivized so you just need to ensure you configure these settings in Tapjoy’s dashboard. SDK Key This is the unique identifier of your application in Tapjoy’s system. Reporting API Key This is the unique identifier for the Supersonic (by ironSource) Mediation platform in Tapjoy’s system. Placement Name This is the unique zone which Tapjoy will deliver ads through. Once you obtain this information, you must configure Tapjoy’s Parameters in your ironSource Account. By adding the above information correctly, you will be able to take full advantage of Tapjoy’s ad inventory and reporting data on ironSource’s Mediation platform. Under ‘Monetization‘, navigate to ‘Placements‘ ➣ User Initiated tab. There you will see the Placement Name. 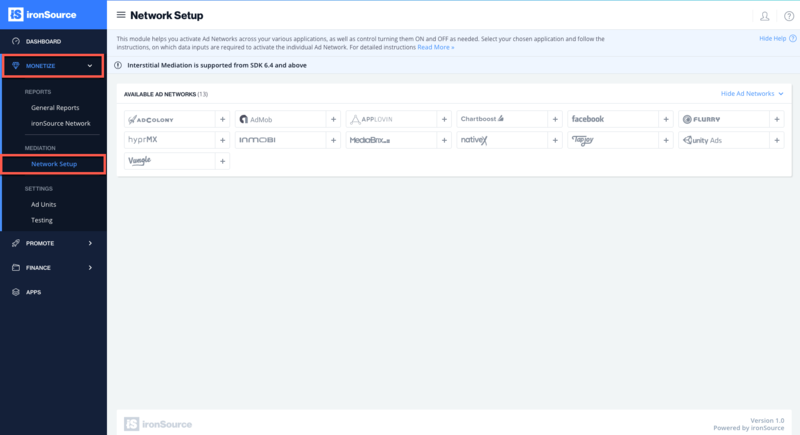 Once you have all of these parameters, log in to your ironSource account and in the left sidebar, navigate to ‘Monetize‘ ➣ ‘Mediation‘ ➣ ‘Network Setup‘. There you will see a list of all supported mediation networks. Select Tapjoy from the list of Available Ad Networks and click on ‘Activate‘ and then ‘Save‘. 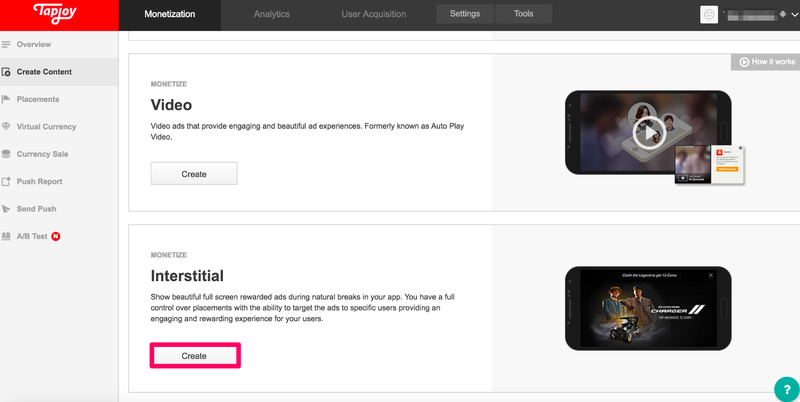 Tapjoy will then be enabled in the Available Ad Networks table. Make sure to select the app on which you’d like to run ironSource’s Mediation with Tapjoy. Next, go to Tapjoy in the Setup list of Ad Networks and click on the ‘Define‘ icon. Insert the ‘SDK Key‘ and ‘Placement Name’ for the relevant ad unit. Set status to Active and click ‘Save’. You will then see Tapjoy as Active for the defined app and ad unit on your Mediation Setup dashboard. Import the ISTapjoyAdapter_[version].unitypackage to your Unity project. You can find the latest Tapjoy Unity Package here. To add the adapter, simply double click on the ISTapjoyAdapter_[version].unitypackage and add all files to your Unity project. Note: If you are upgrading from a previous version, please remove Tapjoy.x.x.x.jar from Assets/Plugins/Android/IronSource/libs. To accommodate changes in Unity version 5.5, the ironSource Plugin version 6.7.1 requires Android Manifests to be added separately for the Plugin and mediation adapter. If you are updating your plugin or currently running on 6.7.1, make sure to add the manifest activities noted in the Android documentation. To add the adapter, simply double click on the ISTapjoy Adapter_[version].unitypackage and add all files to your Unity project. Note: If you are upgrading from a previous version, please remove Tapjoy.x.x.x.framework from Assets/Plugins/iOS/IronSource. Our Unity Plugin adds the necessary frameworks automatically to your Xcode project. 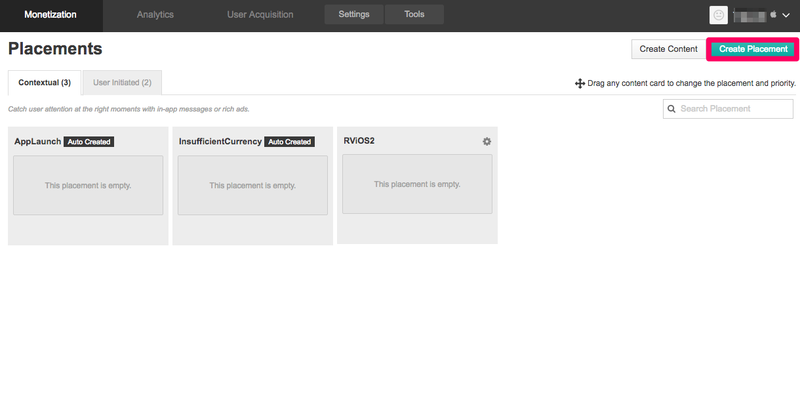 Verify your ad network integration with our Integration Helper. 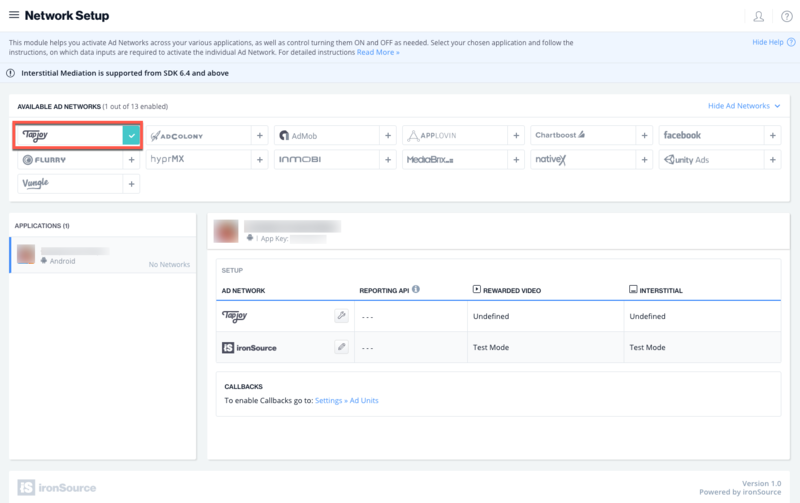 The ironSource SDK provides a tool to ensure you’ve successfully integrated our SDK as well as any additional network adapters. 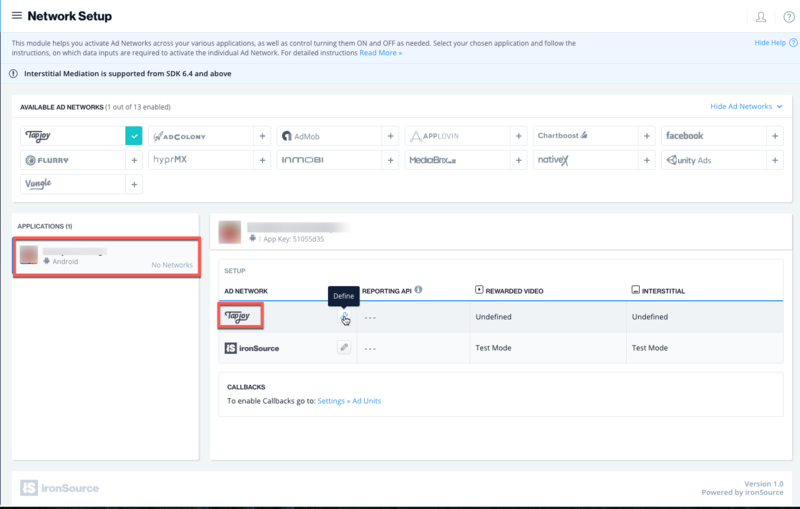 When set to TRUE, this line of code will enable debug logs to help you troubleshoot issues with all of the mediation ad networks that permit to do so. Remove this code before your app goes live with our ad units! Supported for SDK versions 6.5.2 and up. You are now all set to deliver Tapjoy Ads within your application!